As we already mentioned before in the fourth episode about #CISSP resources, the former ten domains has been reduced (and partially remapped), to eight domains and this, due to a more logical (according to (ISC)2 author) organization of topics. 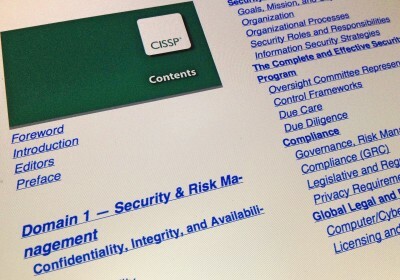 So, for the first CISSP domain, Security and Risk Management, my first job will start from the index. Remember: index could be one of your best friends, ever. I’m a full time employ, husband and father of three wonderful kids. For this reason, my going back to college has been a sort of shock. I’m friendly with technical manual, administrative guide or user guide but…a law manual it’s another game you can’t play with some help or “tricks”. For me, tricks reside in some very useful instrument like mind mapping rather than speed reading or personal growth philosophy. Two of them comes from Tony Buzan head and the last one os a sort of gold mine that is digged by a lot of writer but only a few are capable to pick some precious gold powder. Back to the topic, Index is one of the most important piece of a book. It’s olny partially tought for searching purposes. The other very important scope of index is to give you the seed, the root of a topic. If you can manage one index, you’re in a good shape. This is the good news. The bad news is that, if you happen to chose (ISC)2 CISSP CBK Kindle edition, your index won’t tell you the page number due to his nature. eBook pages changes if you read your tablet in a landscape way rather than portrait. In this case, you won’t be able tu figure out how many pages a chapter is made of. This is an important information that you’re going to lose but, try not to fall into desperation. 😀 By the way, index shows you exactly the skeleton of the chapter. The main question you should be ready to answer with more or less detail, depending on how much you are prepared. Tomorrow I’ll be glad to show you my personal mindmap about the first chapter. Try to do your own map to compare with mine. I’ll try to give as much details as possible. Forgive me but I’m so tired that I can’t even remember with I wrote few seconds ago.